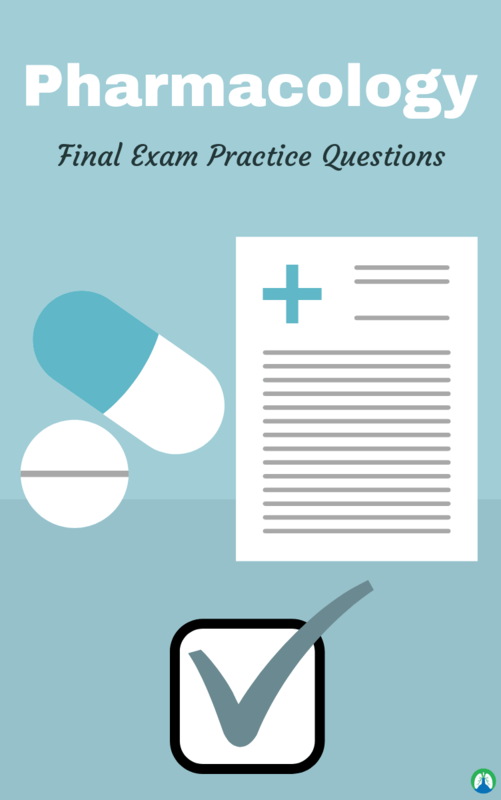 Are you preparing to take the Pharmacology Final Exam in Respiratory Therapy school? If so, good, because you have definitely come to the right place. That’s because, below, you can get access to our study guide that lists out a variety of practice questions covering a wide range of topics about Pharmacology and all of the drugs and medications that are required of you to know as a Respiratory Therapy student. Now, of course, each and every Respiratory program is different, but still, this study guide will serve as a fantastic review for everything you learned throughout the semester concerning Pharmacology. So are you ready to get started? 1. What layers make up the mucosal blanket that covers the airways? 2. Corticosteroids are described as which of the following? 3. Cromolyn sodium is indicated in all but which of the following conditions? 4. All BUT WHICH of the following are complications that may occur with the use of exogenous surfactant? 5. Which of the following disease are characterized by hypersecretion of mucus? 6. Which of the following would occur if it is determined that an alveolus has a surface tension of 40 dynes and a radius of 4 centimeters? 8. The same patient using combination Steroid and Bronchodilator is discharged from a hospital. The patient is sent home with orders for both Azmacort and Proventil MDIs. What is most critical that the patient understand? 9. If a patient experiences an asthma attack as a result of exposure to cats, the asthma would be categorized as which of the following? 11. Which of the following should be stressed when instructing a new patient in the use of aerosolized steroids? 12. What is the mode of action of Acetylcysteine in promoting mucolysis? 13. Allergic and nonallergic rhinitis would be treated with which of the following forms of corticosteroids? 14. Which of the following would be recommended to properly administer Survanta to a 1200 gram infant? 16. All but which of the following are possible side effects seen with systemic administration of corticosteroids? 17. Cromolyn sodium accomplishes which of the following? 18. Which of the following does not appropriately describe Cromolyn sodium? 19. Which of the following reactions may occur when using aerosolized corticosteroids for a local effect? 20. Corticosteroids are naturally secreted by which of the following? 21. Glucocorticoids inhibit all but which of the following cells of inflammation? 22. Which of the following minimizes local side effects associated with the use of inhaled corticosteroids? 23. Which surfactant preparation is derived from the lung of a calf? 24. Aerosol therapy via ultrasonic nebulization has been ordered for the purpose of sputum induction. The patient has thick, copious secretions with frequent mucous plugging. Given that the patient is also asthmatic, what modification of the order should the CRT recommend? 25. A pediatric pulmonologist prescribes Singulair to a 10-year-old female with asthma. What recommendations would you give to this child and her parents? 26. Mucomyst should not be aerosolized with which of the following due to incompatibility? 27. Which of the following statements concerning Mucomyst is NOT correct? D. It has a bad odor. 28. Which of the following should not be recommended for treating severe asthma? 30. An asthmatic patient is about to be discharged from the hospital. What information must the CRT give the patient before the patient leaves the hospital? 32. Acetylcysteine may be delivered by which of the following routes? 33. All but which of the following slow the rate of mucociliary transport? 34. Which of the following occur during an asthma attack? 35. Which of the following are methods of producing natural surfactants? 36. Which of the following drugs breaks down the DNA of infected secretions in patients with cystic fibrosis? 37. When administering Survanta as a prevention therapy to RDS, a premature infant less than 1250 grams should be given the drug how long after birth? 40. Disease states that could benefit from the use of adrenergic bronchodilators include which of the following? 42. Your patient is diagnosed with persistent asthma. Which type of drug would you recommend for maintenance bronchodilation and control of bronchospasm? 44. You enter the room of a 2-year-old patient who presents with the characteristic “barking cough” found with croup. Once the diagnosis is confirmed, you may recommend which of the following medications to help provide relief from subglottic swelling? D. the same as albuterol. 47. Epinephrine stimulates which sites? 49. Racemic epinephrine comes in what percent solution? 53. Albuterol is available in which of the following forms? 59. Inhalation is the preferred route of administering catecholamines for which of the following reasons? 62. Your patient is receiving her third continuous nebulizer of albuterol (15 mg/hr). Which potential complications should you be on the lookout for? 65. Which is the only B-agonist formulation that is a single isomer and is approved by the FDA for aerosol deliver? 66. What is the rationale for using the single-isomer agent levalbuterol instead of racemic albuterol? 67. What is the main difference between salmeterol and formoterol? 68. What is the indication for use of a short-acting B agonist in asthma? 69. Which procedure would tell you that a patient has reversible airway obstruction? D. inspection: patient SOB when walking < 25 ft 34. 71. Which of the following agents will reverse the effects of a benzodiazepine such as Valium? 72. What acid-base imbalance would be seen in a person who has overdosed on barbiturates? 76. A patient with glottic edema is in mild distress. Which of the following medications would be of benefit in this situation? 79. Combivent is a combination drug including which agents? 90. What is the only once-a-day anticholinergic on the market? A. It can be combined with a B-agonist for maintenance bronchodilation in COPD. B. It is added to B-agonist in severe asthma episodes that do not respond to B-agonists alone. C. It is a leukotriene modifier used to treat step 3 asthma. D. It is a first-line choice bronchodilator for COPD. 92. 10 ml of a drug contains 25 mg of active ingredient. How many ml are needed for a 5 mg dose? 93. A COPD patient is receiving a beta 2 agonist via a SVN. The RCP notes that the patient’s heart rate has increased from 75 bpm to 105 bpm during the treatment. What should the RCP do? 94. A confused, combative resident of a skilled nursing facility was administered an excessive dose of Diazepam (Valium). After administration of the drug, the patient cannot be awakened. Which of the following drugs is indicated in this situation? 95. A mechanically ventilated patient who has been paralyzed with a neuromuscular blocking agent should be given a sedative agent for what reason? 96. A mechanically ventilated premature neonate (gestational age 31 weeks) is receiving Beracant (Survanta) for treatment of RDS. After administration of the drug, the neonate’s work of breathing decreases and chest x-ray improves. Which of the following should the RCP recommend? 97. A neonate is to be discharged with apnea monitoring in the home. Which of the following drugs would be prescribed to treat this condition? 98. A patient had a bronchoscopy procedure and biopsy taken of a suspected lung tumor. After the biopsy, uncontrolled bleeding occurs. What should be given to control the bleeding? A. Instill epinephrine through the bronchoscope at the site of the bleeding. B. Administer nebulized Albuterol by small volume nebulizer. C. Administer heparin if intravenous line. 99. A patient is admitted to the pulmonary floor with the diagnosis of Pneumocystis carinnii pneumonia. After evaluating the patient, the RCP should suggest which of the following drugs to nebulize for this patient? 100. A patient is being resuscitated after a cardiac arrest. The resuscitation effort has been in progress for an extended time. The patient might benefit from which of the following at this time? 101. A patient presents to the ER after numerous bee stings. The patient is severely hypotensive and is determined to have anaphylaxis. Which of the following drugs would you recommend to treat this patient? 102. A patient presents to the ER with hypotension, episodes of syncope and a heart rate of 42 beats/min. Which of the following drugs would you recommend to treat this patient? 102. A patient presents to the ER with severe dyspnea, rales in the lung bases, dry cough, and pitting edema. A chest x-ray reveals an enlarged heart with moderate pleural effusion. Which of the following is indicated at this time? 103. A patient receiving both Azmacort and Proventil is sent home with orders for both Azmacort and Proventil MDIs. What is most critical that the patient understand? 104. A patient whose cholinergic activity (suppression of the PNS) in the lungs was blocked would be expected to experience which response? 105. A physician has ordered a 0.20 ml dose of Isuprel (1:200) to be given. How many mg of active ingredient is this? 106. A physician orders 3 mg of dexamethasone. If it is available in a solution of 4mg/ml, how many milliliters should you give? 107. A stock bottle of racemic epinephrine has a concentration of 2.25%. How much of this solution is needed in order to obtain 10 mg of active ingredient? 108. Aerosol racemic epinephrine is helpful in laryngeal edema and bleeding because it stimulates which of the following receptors? 109. An adult male asthmatic is receiving 1.25 mg of a.5% solution of Proventil with 3 cc of normal saline via an SVN QID. His wheezing diminishes but does not completely clear following the treatment. What should the RCP recommend in this situation? 110. An asthmatic patient is about to be discharged from the hospital. What information must the CRT give the patient before the patient leaves the hospital? 111. During therapeutic bronchoscopy for removal of secretions, the pulmonologist is having difficulty aspirating secretions because of their extremely thick, tenacious character. To aid in removal you would recommend? 112. If nebulized Mucomyst is ordered for an asthmatic patient, what other mediation(s) should be simultaneously administered? 113. In ACLS, which of the following drugs can be safely and effectively administered via the endotracheal tube? 115. In which of the following anticholinergic bronchodilators would the RCP give instructions to a patient for proper DPI use? 116. Positive inotropic drugs have which of the following effects? 117. Naloxone (Narcan) would be an affective antagonist for which of the following? 118. Of the following sedative agents, which are considered barbituates? 119. Sputum induction has been ordered for a newly admitted patient with tuberculosis. The patient is a 37-year-old male in no acute distress. Which of the following techniques should the RCP attempt first to collect the sputum? 120. The physician has just determined airway responsiveness to bronchodilator therapy in a COPD patient. He asks the RCP to recommend a bronchodilator for long-term use. Which of the following bronchodilators should the RCP recommend at this time? 121. Which disease state is consistently treated with aerosolized antibiotics such as TOBI? 122. Which of the following adrenergic bronchodilators is available in both a SVN and MDI formulation? 123. Which of the following are considered effective antituberculosis drugs? 124. Which of the following best describes Cromolyn sodium (Intal)? 125. Which of the following best describes Dornase alfa? 126. Which of the following can be used to decrease the viscosity of secretions? 127. Which of the following corticosteroids are available in an MDI formulation? 128. Which of the following is an inotropic agent useful in the treatment of hypotensive patients who have organic heart disease (heart failure)? 129. Which of the following is indicated for a patient in a hypertensive crisis? 130. Which of the following is the most appropriate first-line pharmacologic agent for a COPD patient with severe hypoxemia? 131. Which of the following is true regarding Morphine sulfate? 132. Which of the following is true regarding the nondepolarizing blocker Pancuronium bromide (Pavulon)? 133. Which of the following osmotic diuretics are indicated to reduce cerebral edema? 134. Which of the following pharmacologic agents is indicated in the treatment of a patient with status asthmaticus? 135. Which of the following reactions may occur when using aerosolized corticosteroids for a local effect? 136. Which of the following should be stressed when instructing a patient on systemic corticosteroids in the use of aerosolized steroids? 137. While recording the results of an aerosolized Beta 2 agonist treatment, the RCP erroneously wrote the trade name of the wrong Beta 2 agonist. What should the RCP do in this situation? 138. You are called to the ER to intubate an MVA victim with numerous injuries including chest wall trauma. The patient is very combative. Which of the following drugs would be helpful in performing the intubation? 141. The only depolarizing drug is which of the following? 142. Which of the following barbiturates would be used to control seizures? 143. Neuromuscular blocking agents are clinically used for all but which of the following? 144. Which of the following describes the mode of action of local anesthetics? 145. The preferred route of administration for neuromuscular blocking agents is which of the following? 147. Patients receiving loop diuretics should have their __________ levels monitored. 148. All but which of the following statements are true about diuretics? 149. Muscle paralysis caused by nondepolarizing blocking agents can be reversed by which of the following? 151. Which approach is usually more effective in pain management? 152. Carbonic anhydrase inhibitors can be used to stimulate respirations by creating which of the following acid-base disorders? 153. Which of the following drugs are used as reversal agents for Opioid drugs? 154. Which of the following are uses of Barbiturates? 155. A patient is scheduled to have a FOB (Fiberoptic bronchoscopy) due to hemoptysis. The patient is given Versed prior to the procedure. Which of the following should be monitored during the procedure? 156. Which group of diuretics are the most potent? 157. You are caring for a patient who has sustained a severe closed head injury. The ICP monitor reads a pressure of 38 mmHg. To reduce the cerebral edema and lower the ICP, you would recommend which diuretic? 159. A patient is scheduled for a surgery that will require a neuromuscular blocking drug to be given. Upon examination, you find that the patient has bilateral expiratory wheezing, has increased expiratory time, and has small amounts of mucoid secretions. What neuromuscular drug would you NOT recommend for this patient? So there you have it. I hope that this study guide was helpful for you and can serve as a great review for your Pathology Final Exam. As I mentioned before, I realize that each Respiratory Therapy program is different, so I may not have included a question about every single topic that you’ll see on your final exam. Still, if you go through this information, I have no doubt that you can boost your knowledge and improve your score when it’s all said and done.